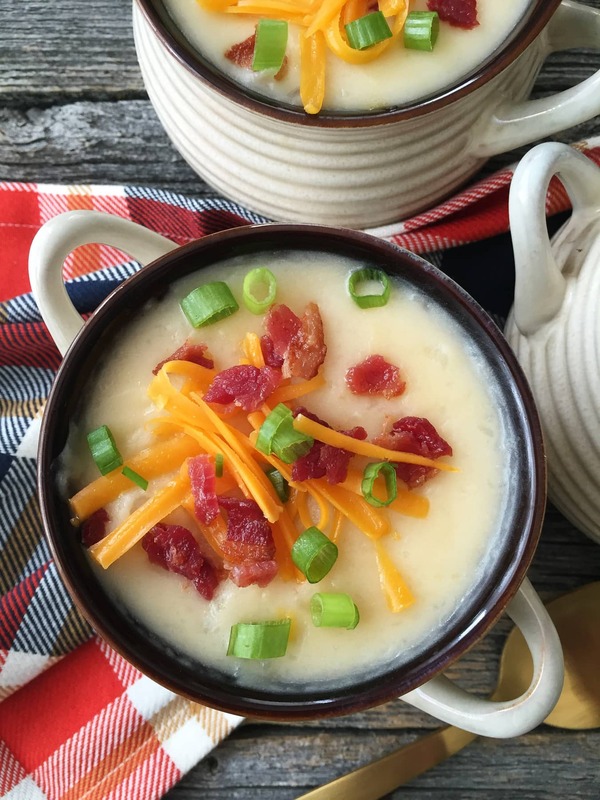 This Slow Cooker Loaded Baked Potato Soup is a perfect weeknight meal. Add all of your favourite baked potato toppings! Ahhhh fall. 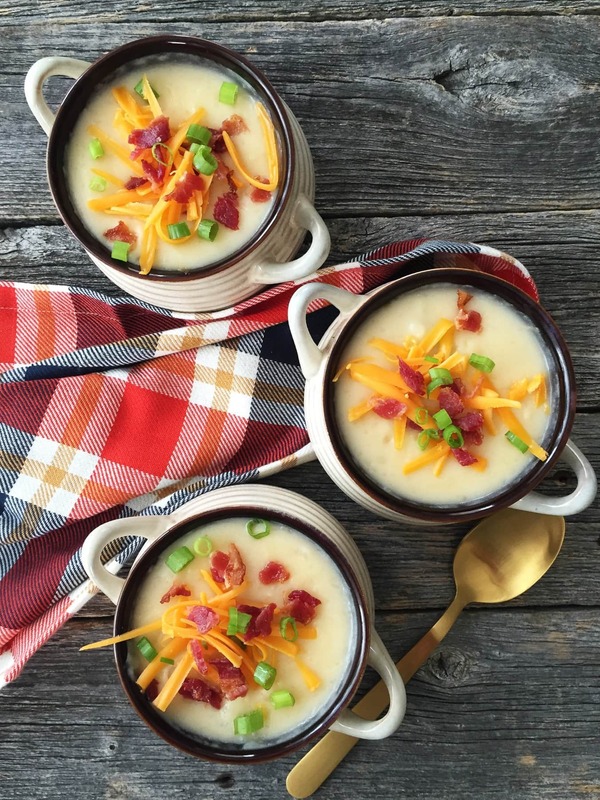 The season of soups, stews and all comfort foods. I love it. I think cooking in fall is actually my favourite. I love the routine of cooking meals, the smell of dinner simmering on the stove and the comfort of hearty food. SO good. And yet at the same time, getting back to the routine of meal planning can be tough…gone are the lazy days of summer meals. But not to worry, we can get through meal planning together! 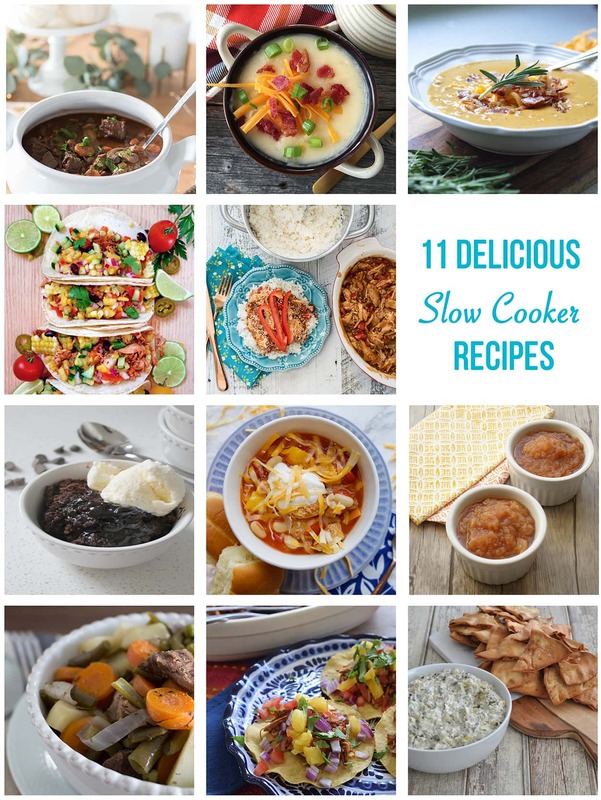 In fact, today you are going to come away with 11 Slow Cooker Meal Recipes! I’ve joined 10 bloggers, and we’re each sharing a slow cooker recipe. All delicious. All simple. And all perfect for fall. 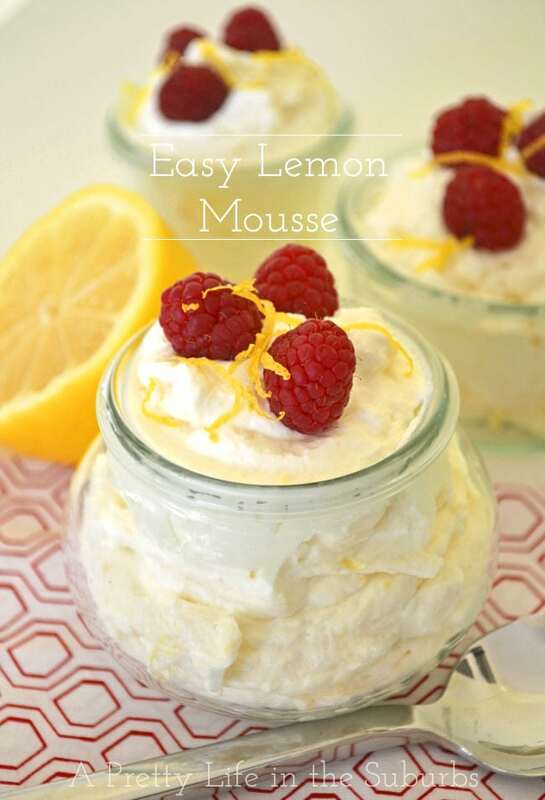 So make sure to visit their recipes at the bottom of this post! 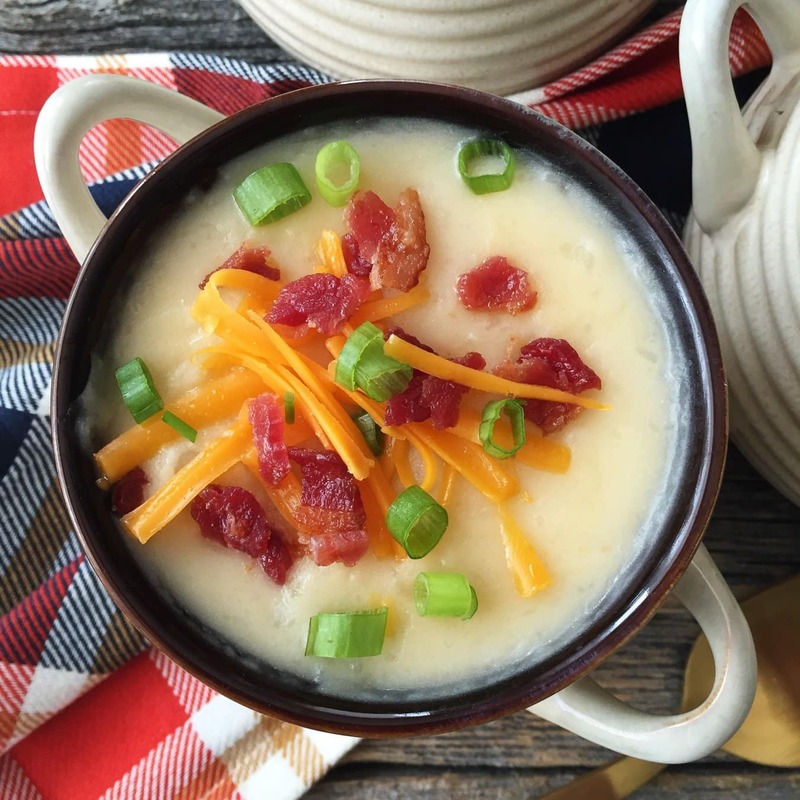 To get things started, I’m sharing a recipe for Loaded Baked Potato Soup. 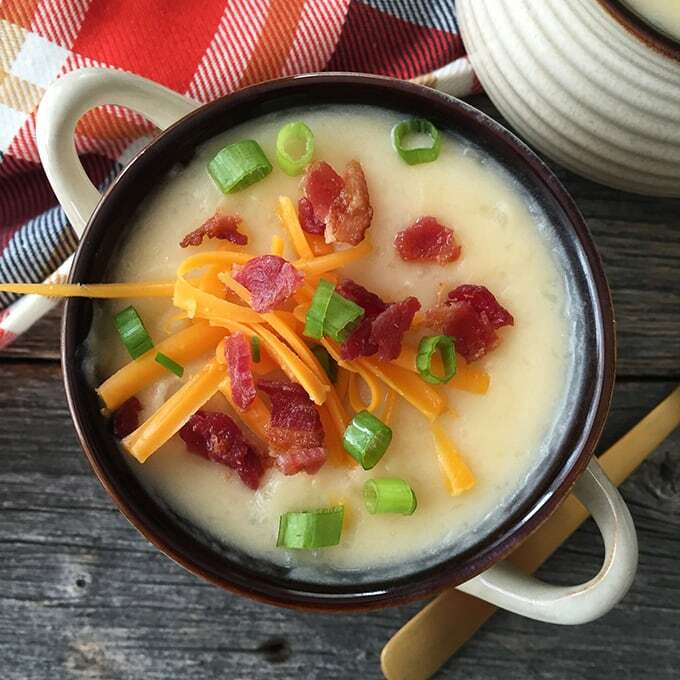 If you love loaded baked potatoes, then you will love this soup…with all the same flavours of creamy potatoes, bacon, cheese, and green onion. 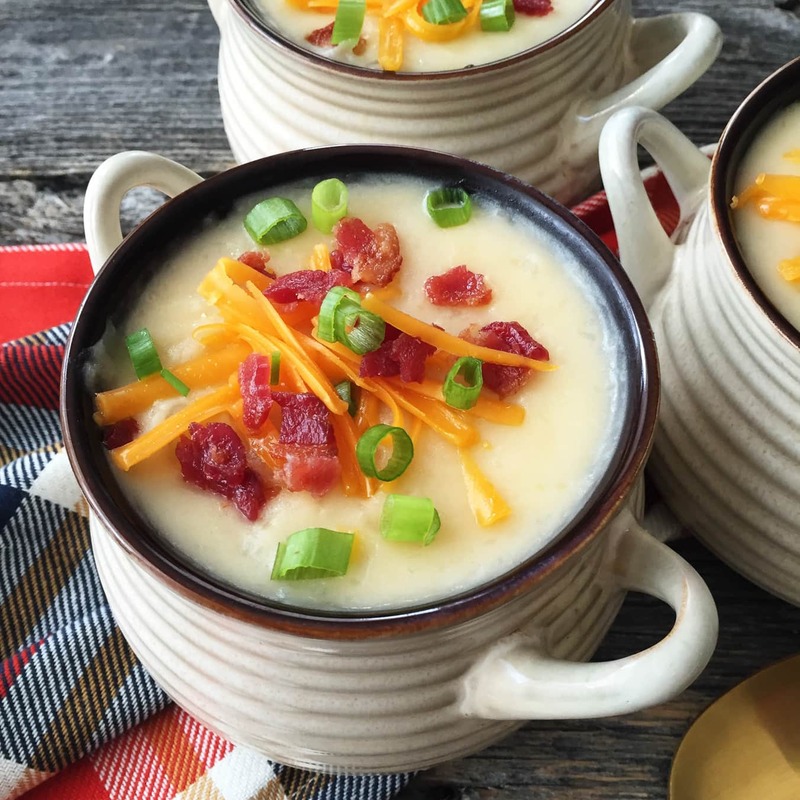 This soup is a winner winner slow cooker soup dinner! 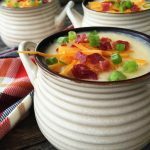 Actually besides how delicious this soup is, one of the best things about this soup is that you can make it in the slow cooker. Put everything into the cooker in the morning, and come home to dinner ready. All you have to do a the very end is stir in some cream, add cheese, then dress it up with your favourite baked potato toppings. Extra cheese, bacon bits and green onion. Yes. Please. It’s comfort in a bowl. Serve with a green salad and fresh bread, and you’ve got dinner covered. Simple and so good. Peel the potatoes and cut them into 1/2 inch cubes. In a slow cooker, add the chopped potatoes, minced onion, 3 slices of bacon (uncooked), and the 1 L of chicken broth. Cook on the LOW setting for 6 to 8 hours, or on HIGH for 3 to 4 hours. At about 30 minutes or so before the soup is done cooking in the slow cooker, remove the 3 bacon slices. Then using either a potato masher or immersion blender, blend about 3/4 of the soup if you would like it to have some potato chunks. If you would prefer a smooth soup, blend the entire soup. Stir in the cream, sour cream and 1 cup of shredded cheddar cheese until smooth. Cook for about 10 to 15 minutes more. Serve with your favourite toppings: green onion, bacon bits and more shredded cheese. 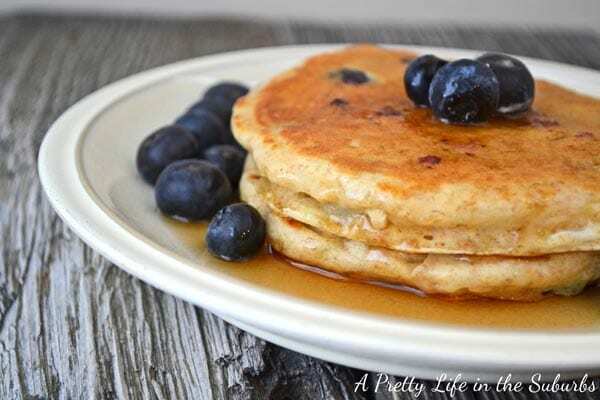 Here are 10 more delicious recipes to make in your slow cooker. 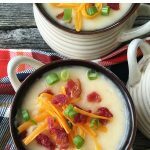 Slow Cooker Loaded Baked Potato Soup by me! This looks so good. Perfect in those cute little bowls. 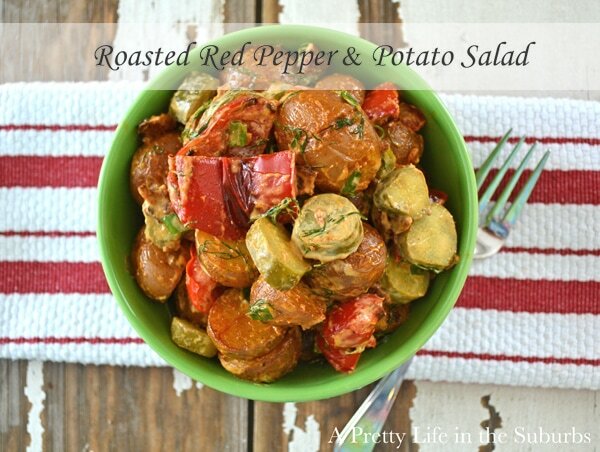 A meal to really warm on those crisp fall days! Can’t wait to give this one a try! I was worried that it could be starchy too, but this recipe isn’t at all! It’s so good! I think the extra cheese stirred into it helps with that. Definitely not keto friendly but I’m gonna have to try it! Thanks for sharing.